The most comprehensive book on False Deals ever conceived is now available. Written by one of the greatest living False Deal experts and performers; Wesley James is also one of the most detail focused writers in magic's long history. This is the third book in the Wesley James "Technique Mastery" series, which currently includes A Call to Palms , Neo-Shufflogica and, now, It's Your Deal . Planned future volumes include I'll Pass and Cooler than Ever . If you think you know all about False Dealing, you're almost certainly mistaken; Bottoms, Seconds and Middles just scratch the surface. No one volume could be fully comprehensive on this broad subject, but this large volume will teach you all you're ever likely to need to know. It includes Double Deals, Greek/Minus One Deals, not to mention Punch Deals and No/Steal Deals. The sources come from Maskelyne to Maze, Merlin to Marlo, Erdnase to Vernon, plus Carlyle, Lavand, Kennedy, Ackerman, Robinson, Torrales, Wimhurst, and more. Of course, Wesley also includes his own techniques: The Sure Theory Second, Theory Thirds, the Option Second, the Beveled Whisper Bottom, Second and Middle Deals, but much more. Each detailed description faithfully captures the original published treatment but adds insights, emendations, and improvements. Wesley builds on the techniques that have been published adding the fine points that make his False Deals among the finest ever developed, so illusionary it seems impossible they could be False Deals. You'll have to invest time to gain proficiency, but it's all here for you to absorb. 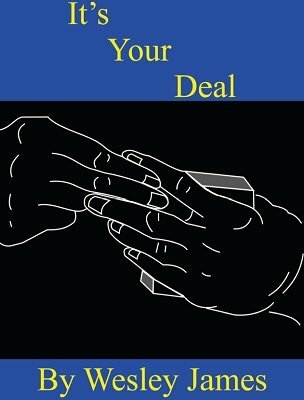 Wesley also includes a critical section on how to learn to False Deal by Dealing. This tutorial section will have you False Dealing as quickly as the techniques can be acquired. It is a pedagogic breakthrough that focuses on the keys to gaining the requisite skills necessary to use the False Dealing techniques you'll learn in your magic. Then, you'll find some of the most powerful magic ever published using False Deals. All this knowledge has been packed into 400 plus dense pages, the largest book on the subject ever compiled. It's a book you'll return to frequently for many years to come, as your skills and interests expand. Get your copy today, at the bargain price of just $60. 1st edition 2018, 405 pages.